Matthew P. McAllister is Professor of Communications in the Department of Film/Video & Media Studies at Penn State. He is the author of The Commercialization of American Culture (1996, Safe), and the co-editor of Comics and Ideology (with Ian Gordon and Edward H. Sewell, Jr., 2001, Peter Lang), Film and Comic Books (with Ian Gordon and Mark Jancovich, 2007, University Press of Mississippi), and The Advertising and Consumer Culture Reader (with Joseph Turow, 2009, Routledge). Emily West is an Associate Professor in the Department of Communication at the University of Massachusetts, Amherst, whose work focuses on consumer culture, gender and performance, and media audiences. 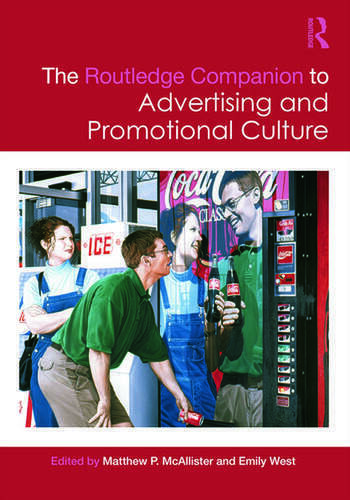 Her research on the commodification of sentiment and nation branding has appeared in journals including Media, Culture & Society, Critical Studies in Media Communication, Journal of Consumer Culture, Feminist Media Studies, and Popular Communication. Her newest work is on discourses of consumerism in US healthcare policy.